Boasting a great spiritual importance among the Hindu devotees, Tirupati Balaji is one of the holiest and most frequented religious spots in India. Present as an abode of Lord Venkateshwara, an incretion of Lord Vishnu, this temple is popular as 'Vaikuntam' on the earth. A horde of spiritual travelers swarms this place every year to drench themselves in utter spirituality and serenity. Thousands of devotees visit this temple everyday to pay homage to the utmost power. This 03 nights and 04 days itinerary is a comprehensive schedule for the travelers who want to visit the epicentre of Hindu spirituality. This tour is perfect for the travelers who want to accomplish their wishes and wash away their sins in a destination sacrosanct and divine. Arrive at Chennai and meet our representative to get the assisted transfer to the hotel. Go on a sightseeing tour covering Snake Park, Marine Beach and other major tourist attractions in Chennai. Overnight stay at pre-booked hotel in Chennai. Take a road journey to Tirupati in morning. On arriving at Tirupati, transfer to the hotel. 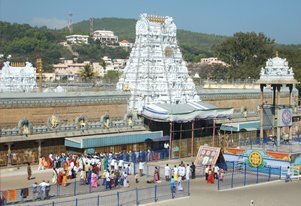 Tirupati is the most frequented pilgrimage destinations in the country. It is dedicated to Lord Vekateshwara (Balaji). Overnight stay in Tirupati.